Brooks Koepka beating Tiger Woods for the Wanamaker Trophy and the 100th PGA Championship gave us some great golf and wonderful competition on a demanding course, but it is increasingly apparent the fourth major needs something to distinguish it from not only the other majors but the week to week traveling circus a.k.a. the PGA Tour. By way of comparison the Masters, Bobby Jones’ tournament, has the tradition of being played early in April at the same course conveniently timed just as the weather is warming for golf in much of the country. The U.S. Open is our national championship and typically played on courses so difficult they would bring tears to the eyes of most amateurs. The British Open is the oldest, most historical, theoretically open to anyone in the world and often on linksland which requires an entirely different style of golf virtually unknown in this country. The PGA really has nothing unique other than the mythic determination that somehow, it’s a “major” even though the field includes 20 club professionals. The schedule change next year to May between the Masters and the U.S. Open could be a real shot in the arm. But truthfully it still needs a singular uniqueness to better establish its identity…push it towards the front of the pack that not only includes the other three majors but the four World Golf Championship events, the FedExCup and other big tournaments during the year plus the Olympics every four years and the Ryder Cup or Presidents Cup annually. Even though television executives may not like it the time has come to convert the PGA Championship to match play as it was until 1958. Keep the PGA professionals as part of the 156-man field and simply have a 36-hole qualifier on Wednesday and Thursday to select an elite 32 for match play. One last thought on the PGA—the possible venues could be expanded by going outside of the states occasionally to gain not only the publicity but more international fans. As I said just a thought. 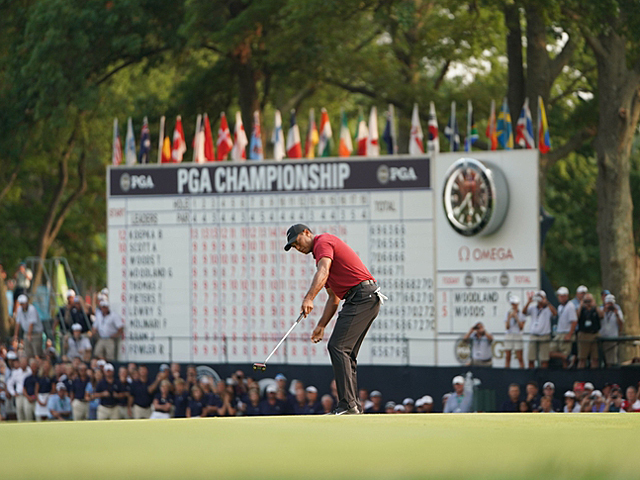 Tiger Woods: A seeming lack of focus on the 14th hole of the final round and wide right drive into the hazard on 17 sealed Woods’ chances for winning his fifth PGA and 15th major. However, his final round 64, his lowest round ever in a major championship, had fans glued to their televisions. It’s not going out too far out on a limb to say not only will he soon win again and his position now at 11th in the Ryder Cup points list means a role as a playing vice-captain on the Ryder Cup team is a given. Woods comeback to tournament winner and major champion will be of the same magnitude as Ben Hogan returning after his 1949 collision with a bus. Disappointments: Play in the PGA by much of the U.S. Ryder Cup team was not inspiring and except for Justin Thomas none were ever in contention. Dustin Johnson finished T-27, Jordan Spieth and Rickie Fowler T-12, Webb Simpson T-19 and Bubba Watson who along with Phil Mickelson missed the cut. TV Coverage: You would think that TNT, which covered the first two days of the PGA Championship in conjunction with CBS Sports for the weekend, could have done a better job but it was refreshing to hear the critics going after someone other than the coverage on Fox of the U.S. Open.